A l’occasion de l’anniversaire de la naissance de son fondateur le 13 novembre, notre partenaire la JOCI invite à un débat public. 15h55 Opening statement – IYCW concept on just work and social protection. 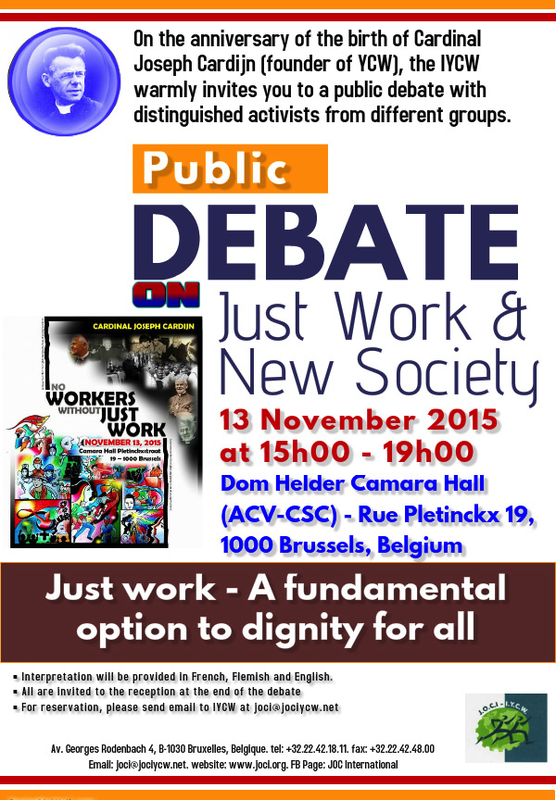 16h00 Debate : Just work – A Fundamental Option for Dignity for all toward new society. What do you see and think on world of work situation today link to social protection and current international crises and turbulence ? What kind logic of development – new society and new human life model– that you want to promote ? How to go there ? JOC, KAJ, ACV-CSC, WSM, Maison Jociste, IMCS, IYCS, MIDADE, ITUC, ETUC, ETUI, Social Alert, Mijarc, Entraide et Fraternité, Broederlijk Delen, Fimarc, ILO Brussels, UNDP, 11.11.11., DBI, CCI, CETRI, Caritas, KolpingInternational, ICYCW, MMTC, JESC, Santegidio, Paxchristi, Donbosco, Segec, VSCO, COMECE, European Parliament, European Commission, Solsoc, FAAB, Solidar, ADI, MIAMSI, ICMC, MOC, Beweging.net, CIEP, Justice and Peace, CEFOC, CCFD, Missio, CIDSE, Monde Selon les Femmes, Aidtothe Church in Need, Vie Féminine, Mutualité, CARHOP, KBE, La Fonderie, Nonciature, Aprodev, FNV, Brussels Diocese, LiegeDiocese, EPD, CEC, Espaces, FOS, ECO, Philipino Chaplaincy, Migrante, Cardijn Holland, EZA, Misereror, Kindermissio, Uniapac, Pax Romana, SIIAEC, ICMICA, Pontifical Councilof Justice and Peace, ILOPARDEV.